Frank Lucas: The loudest one in the room is the weakest one. That’s some solid advice from an unflappable, businessman/innovator who also happens to house an unshakable tyranny beneath his nondescript black overcoat. The man is Frank Lucas – a North Carolina-born crime boss who sold top quality heroine at discount-store prices to the good people of Harlem in the late 1960’s and ‘70’s. The advice would have been better taken than given as one loud moment, one indulgence in pride and riches, would ultimately lead to his unraveling. Having accepted an innocent gift from his beautiful wife, Lucas arrived at boxing title bout in a pimped-out chinchilla fur coat and matching fedora. All eyes were drawn to the man who dressed with such impeccable flare and had better seats than some of the highest profile gangsters in all of New York City. One of these sets of eyes belonged to Richie Roberts, a Jersey detective who was heading a covert task force determined to make big moves in the war on drugs. Before this, Richie didn’t even know whom he was hunting but now he at least knew where to start looking. That moment is now a pivotal scene in Ridley Scott’s AMERICAN GANGSTER, a juxtaposition of Lucas’s rise and demise offset against the blind pursuit to bring his untouchable operation to its knees. 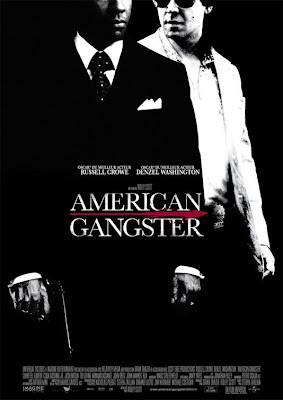 AMERICAN GANGSTER is (aside from seeming like a blatant attempt on Scott’s part to latch on to some of the residual success from Scorsese’s return to glory with THE DEPARTED) an exploration of the vast field of gray between what is supposed to be the clear black and white ends of the law spectrum. Lucas (a fiercely calculated Denzel Washington) hands out turkeys to his Harlem brethren while getting their children hooked on some of the purest heroine on the streets. Roberts (a disheveled and determined Russell Crowe) refuses to play into the dirty cop stereotype, even going so far as handing close to a million dollars into his superiors, but disrespects his ex-wife and disregards his responsibilities as a father. Still, both see themselves as examples that should be followed because they follow a strict life code built on core American values like integrity and hard work. What neither understands about themselves or each other is that abiding by such a rigid set of guidelines for a successful life touches every facet of your image, from where you live to what you eat for dinner to how you treat your family. Not to mention, while they spend so much time defining themselves as model Americans, they lose their individuality. 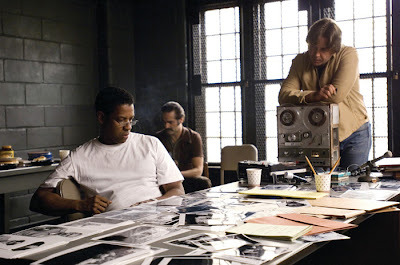 Both Washington and Crowe are impressive performers, each boasting past experience that would make them clear choices for the roles they were cast as in AMERICAN GANGSTER. Washington, having done twisted and unpredictably violent in TRAINING DAY, now takes a more stoic approach to evil as he is unflinching even when lighting someone on fire only to shoot them in the head seconds later. (I guess he just needed to be sure his last moments alive were spent in agony.) Crowe, having played the manly cop in L.A. CONFIDENTIAL, brings a certain nervous uncertainty to the authority figure icon. 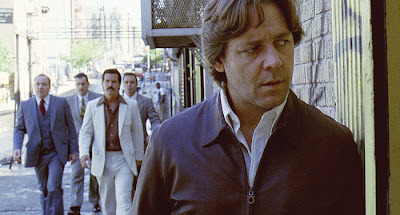 Each is capable of carrying a film on his own and, in AMERICAN GANGSTER, they each essentially have to as the two share the screen for what amounts to maybe ten minutes. In what is perhaps Scott’s greatest movie magic trick, he splits the film into two distinct pieces that exist on their own but depend on each other for purpose. While Roberts runs around the city chasing after Lucas, he never knows that it is Lucas he is actually gunning for. At the same time, Lucas never knows Roberts is after him until it is too late. All that stands between Crowe and Washington now is Ridley Scott. There is no contesting AMERICAN GANGSTER’s ferocity but its dynamism is severely overrated. Good cops and bad cops have been done to death (although none nearly as delicious as the sleazy turn by Josh Brolin as the crooked cop ringmaster) and the same can be said for bad guys who love their mothers. By now, we all know the world is gray but strong performances, a sharp 70’s visual style and companion soundtrack do their best to distract us from seeing that we aren’t really learning anything new. The action moves into the clubs. The threads are slick; the tunes are smooth; the club is definitely swinging but the scene is getting tired.